As part of my Hunting Wild Yeast project I am preparing a series of articles introducing brewers to the various wild yeasts and bacteria that can be found in wild-fermented beverages. But there is no point in describing the various players in a wild ferment without first describing what a wild ferment looks like. Unlike conventional ferments, while involve one (or perhaps two) well characterized pure strains of yeast, wild ferments involve the successive action of a series of yeasts and bacteria. The organisms tend to appear in waves, with the ever changing nutrient and alcohol content of the brew enabling some species to thrive, while others die off. This complexity is what creates the unique flavours of a wild brew – a complexity that simply cannot be achieved with purified yeasts. My end goal is to purify a series of wild strains that can be used to replicate these multi-stage ferments, but without the risk of a true wild ferment – that being, contamination with a spoilage organism. In this article I will briefly cover what is known of wild ferments, including the various species that can be found during the fermentation process. From the skin/hulls of fruit/grains. Essentially, the organisms normally found on the skins of the fruit (wine) or hulls of the grain (beer) are allowed to inoculate the wort. This is more common in wine making, where crushed fruit are left in contact with the resulting juice; thereby inducing a fermentation driven by the organisms which thrive on the skin of the fruit. This method is rarely used for beers, with the exception of relying on lactobacillus (a bacterium) from the hulls of barley for sour mashes. Collected by exposure to the air. Traditional lambics and their modern US counterparts – coolship ales – rely on airborne yeast to inoculate the wort. In these ferments, the wort is left in an open vessel which allows wild organisms to fall into the wort. A few breweries are experimenting with exposing beers to the air of wineries and orchards, in order to get more fruit-derived organisms. Usually this exposure is limited to an overnight period, but some brewers are experimenting with longer exposures. By exposure to an inoculated barrel/fermenter. This is a case of “what is old is new again”. Historically, most ales had a bit of ‘wild’ character, brought on by ageing of beers in barrels that had low-level Brettanomyces contamination. Today, some brewers and brewclubs are using barrels, oak cubes, and fermentation dregs to ferment wild beers using a known & pre-established group of organisms. Indeed, my wild yeast project is aimed at a more technical version of this – a series of pure strains which can be combined to produce the desired flavour profile. OK, so that is where the wild organisms are acquired from – from the skins of the fruits/grains used to prepare the wort, or from the environment, or from trusted pre-inoculated sources. So what happens next? The answer is, in simplest terms, war. Upon inoculating fresh wort, the organisms begin proliferating like mad, each one trying to out-reproduce the others. The fastest organisms dominate early, but over time increasing alcohol levels and reduced nutrient levels allow other organisms to dominate. In the long haul only a limited number of species are capable of holding on, with yeasts of the Brettanomyces and Saccharomyces genera dominating, along with bacteria of the Lactoacillus and Pediococcus genera. One thing to realize is there are no hard-and-fast rules here; every country, city, household and room has its own unique set of species. Meaning a wild ferment started in your kitchen could end up totally different than a wild ferment started in your bedroom…or bathroom, although I’d recommend against the latter and whomever you share your bedroom with may have issues with the former. Luckily for us, scientists have looked into what organisms grow in ‘typical’ wild ferments in beer and wine. But as we go through these examples, keep in mind the last paragraph – it is more likely your own wild brew will involve different organisms that those uncovered in these studies. One last comment – the serious beer-heads may be wondering why I’m wasting my time covering the wine organisms; the answer there is simple. A) I brew wine, and B) fruit represent a source of potentially useful organisms which we may be able to use for beer or wine. Yeast and bacterial organisms found in coolship ale. Lambics (and their American equivalents – coolship ales) aquire their yeasts and bacteria from the air. This creates a unique fermentation profile compared to ferments which rely on organisms collected from fruit skins (see next section). These coolshop ale fermentation profiles were provided by the hard work of Nicholas A. Bokulich, Charles W. Bamforth and David A. Mills, whom in their excellent article Brewhouse-Resident Microbiota Are Responsible for Multi-Stage Fermentation of American Coolship Ale carefully analyse the yeast and bacterial content of a coolship ale brewed by an anonymous ‘independent craft brewery located in the Northeastern United States’. The Yeasts: Initially there is a number of yeast strains present in the ferment, but this multitude readily gives way to a few dominant species. Early on we see two species of our old friend Saccharomyces – conventional ale yeasts (cerevisiae) and bayanus; a species occasionally used in cider and wine making. Smaller populations of Pleurotus opuntiae (a mushroom), Cryptococcus keutzingii (a poorly characterized fungus), Candida krusei (the yeast involved in producing chocolate), Pichia fermentans (normally found on our skin & on fruits) and Rhodotorula mucilaginosa (a red-pigmented yeast) appear early in the fermentation process. This mixed pool of yeasts declines after a few weeks to a ferment dominated first by Saccharomyces cerevisiae/bayanus. Months later Brettanomyces bruxellensis appears, and rapidly overtakes the beer. Over the next couple of years the Brett dominates, with other yeasts (mostly Cryptococcus keutzingii) making the odd short-lived comeback. The Bacteria: Unlike the yeasts, the bacterial component starts off with one group dominating – the Enterobacteriaceae. And this is not a good thing – this includes species like E. coli which aside from being a large portion of our feaces also causes food poisoning. Too much of this in the beer equals a taste and aroma often described as ‘vomit’. 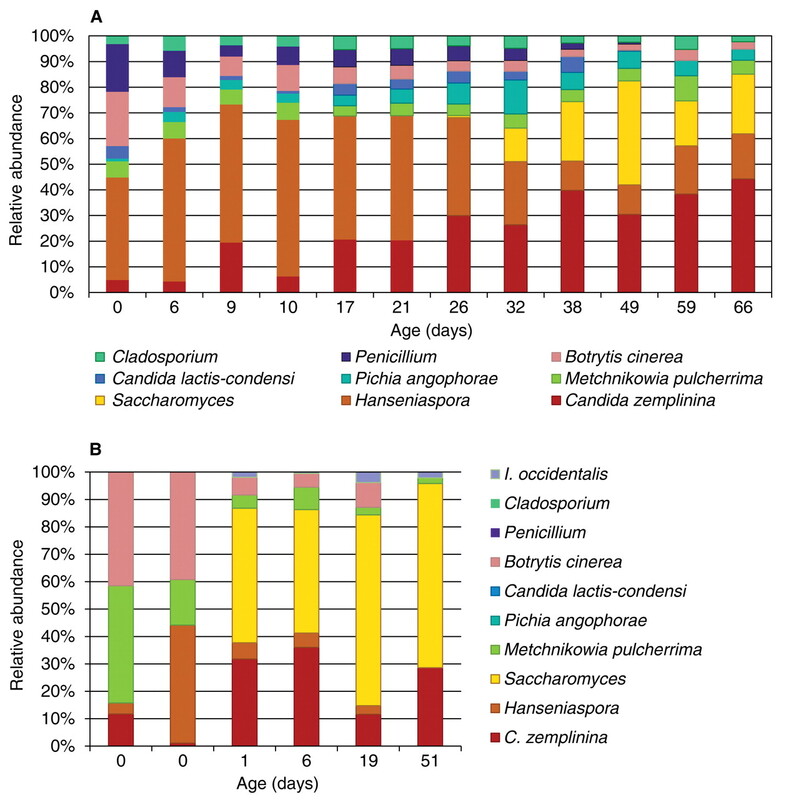 The good news is that this is rapidly replaced, first by a range of species (see figure for the details), eventually giving way to a large group of bacteria – the lactobacteria. This includes the lactobacillus & pediococcus species we tend to accosiate with sour beers. Within the lactobacillus & pediococcus genera there are a number of species which appear and disappear over time, but the good news is that these are the bacteria we want; as they provide sourness and some other flavour compounds – and do so without the flavour of vomit. As a counter-example to the above collection of yeasts/bacteria from the air, lets look at a ferment driven by the organisms found on grape skins. Using fruit skins provides a very different profile of organisms, as your limiting your organisms to those capable of living on the acidic/sugary skin of a fruit (as compared to anything floating around in the air). This offers the advantage of limiting the organisms in the ferment to species already good at living under fermentation conditions, versus anything floating in the air. This article was provided by the same group which I discussed above, but this time they assessed only yeast, and looked at two different vintages of a wild-fermented wine from the Dolce Winery in Oakville California. While the two wines had very different yeasts, a similar trend appears in both. In both cases a mixed population gives way to a population dominated by one or two species. For the sake of brevity I’m not going to cover all of them, but common wine yeasts such as Hanisporia (AKA Kloeckera apiculata, discussed in a previous post), Candida zemplinina, Picha, and Metschnikowia pulcherrima. 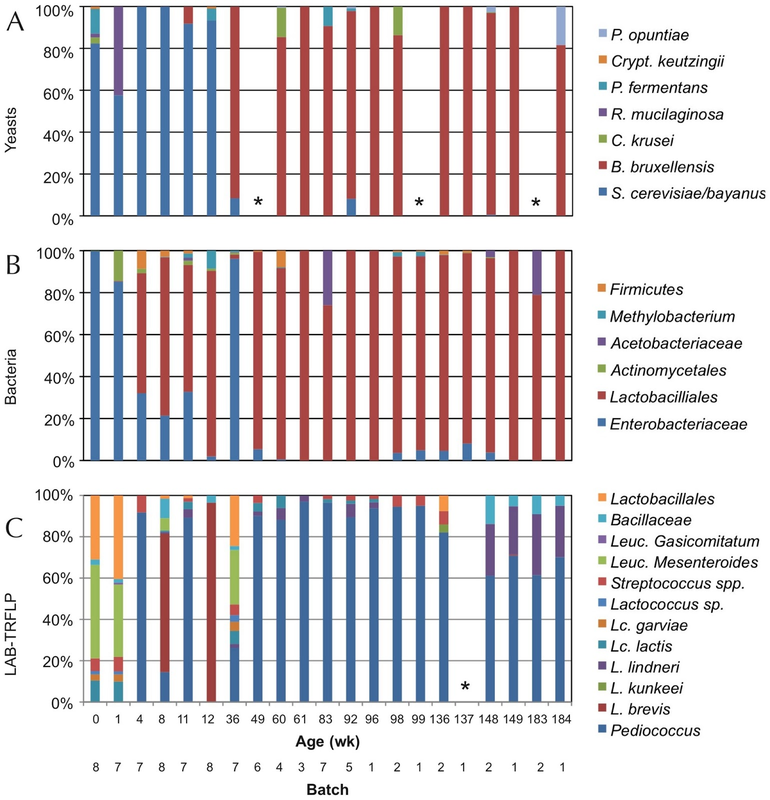 These (and other) mixed species give way to Saccharomyces as alcohol concentraitons pass 5%/volume, although the populations remain mixed throughout the 66 weeks the wines were monitored. The source of the organisms can greatly effect the organisms that end up in the fermentation, and thus the final flavour profile of the beer. Most ferments start with a large number of species early on, but give way to a limited number of species as the alcohol content rises. While potentially dangerous organisms are occasionally observed early on, they are readily replaced by safe – even potentially pro-biotic – species. In terms of the final flavour of the beer/wine, the characteristics imparted by the organisms which dominate earlier will predominate. But the early fermenters can contribute, both by directly providing flavour compounds (few of which will survive intact over a long ferment) and by providing compounds which are further modified by organisms which appear later in the ferment. if one had the ability to isolate a specie such as Pichia fermentans, would you be able to utilise it to ferment a beer soley by itself?